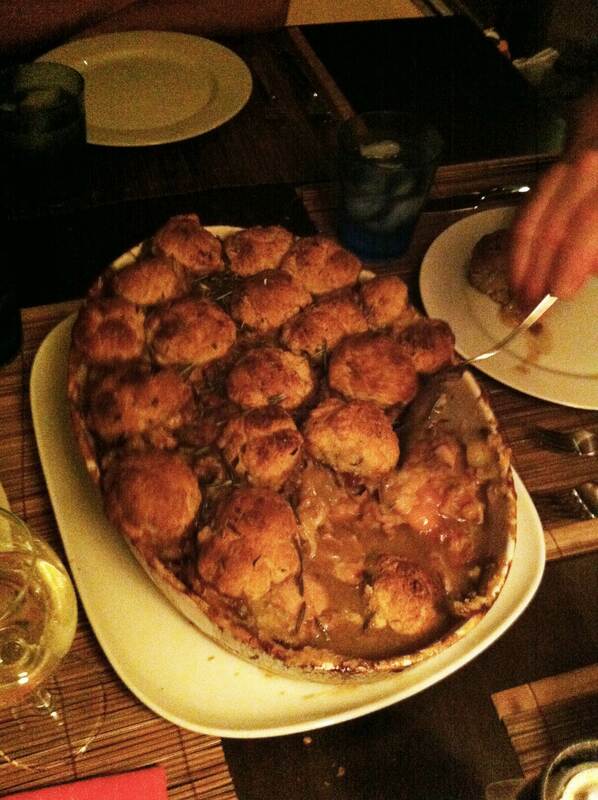 First off let me say that the baking dish I made this in was a bit small for the amount made and that the dumplings, which look nice in the picture should really have sunk down a bit into the gravy. Small point, but you know I’m fussy. Secondly you could easily make this dish with Rabbit which was my intent until I discovered how hard it was to find them. Fazio Farms sells them at the Friday Union Square Market that sells local Rabbit but my timing was off so I got chicken thighs (skins and bones) which are much cheaper and just as delicious. To add extra flavor I bought Hickory smoked slab bacon at Heritage Foods, which was very smoky, you can use any bacon you want or omit it altogether if you want. This is a great dish for a crowd and very straight forward and simple to make. Serve with a large salad and something light and sweet for desert, like seasonal berries with cream. In a large bowl sift 3 cups of All Purpose Flour, 1 Tablespoon plus 1 teaspoon of Baking Powder, 1 1/2 teaspoons of Sea Salt, a generous grating of black pepper and 1 Tablespoon of Brown Sugar. Sprinkle over the flour mixture 3 Tablespoons of Fresh Thyme, lightly chopped. With you hands or a pastry mixer gently work in 14 Tablespoons of unsalted Butter. You want the butter incorporated into the flour, but with a few small bits of it still remaining. All at once pour in 1/4 cup of Half and Half (Whole Milk, Heavy Cream or Water would also work) With a wooden spoon or spatula bring the dough together – if it is too dry add a little more liquid if it is too wet add a little more flour. You want a nice, moist, workable dough. Roll the dough gently into a long rope. Divide into 16-20 pieces (depends on the circumference of your cooking pan and the amount of dumplings you want – just don’t make them too big). Roll into balls and place on a lightly butter platter. When down cover with a barely damp towel and place in the fridge. You should have about 4-5 pounds of chicken thighs, rinsed, patted dry and seasoned with salt and pepper. Dredge each piece in flour and set aside on a plate until all of them are done. In a large frying pan add 2 Tablespoons of Butter and about 1/4 of Olive Oil over medium high heat. When the oil is hot but not smoking start to brown the chicken pieces – about 4 minutes on each side. when browned remove to a paper towel and repeat until the are all done. Wipe out the frying pan and add 1/2 pound of roughly chopped Bacon fry until the fat has been rendered but don’t let the bacon get crisp! Add 3 large sliced Cooking Onions and saute until they wilt, stir in 6 finely chopped Garlic Cloves, 4 large branches of Rosemary and 1/2 pound of de-stemmed and roughly chopped Shiitake mushrooms (Cremini work fine in a pinch). Stirring often cooked until the mixture is all wilted – a few minutes. Season with salt and pepper. In a medium bowl added 1 1/2 Tablespoons of Flour slowly whisk in 24 ounces of Amber or Dark beer (Brooklyn Brown would be ideal). Then add 3 cups of Chicken Stock. Pour this mixture over the wilted aromatics and bacon….cook at a simmer for 10 minutes. You want the liquid to reduce by about 1/4. In a large baking dish (a clay cazuela, a Cast Iron dutch oven, or an Enamel Dutch oven like Staub or Le Creuset all would would) place the browned chicken then carefully pour over the beer and aromatics mixture. 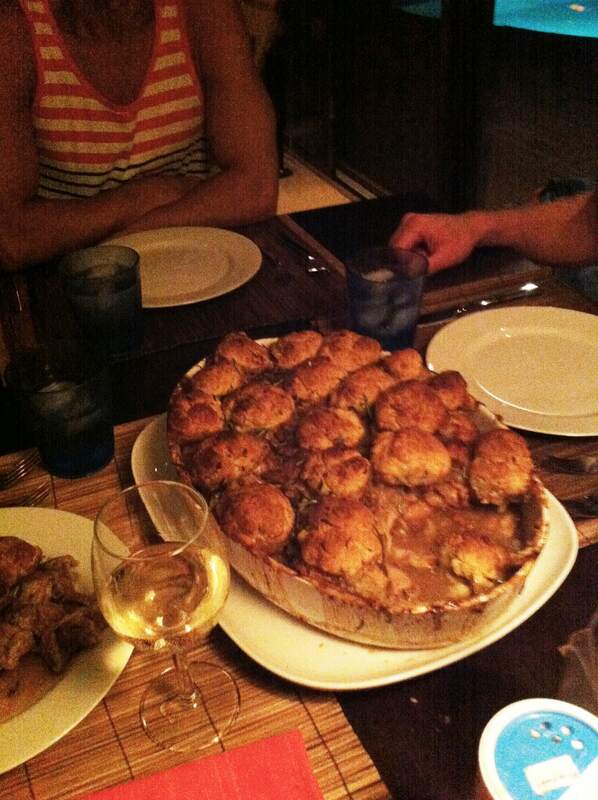 Cover with dumplings. Sprinkle the top of the dumplings with olive oil and some sea salt and freshly grated black pepper and pop into the oven. Cook for 45 -55 minutes depending on how big your chicken pieces are and how much you used. Erring on the longer side isn’t going to harm the dish, just make sure there is enough moisture. This is a fall off the bone affair. Just warn your guests that the chicken is on the bone – some people seem squeamish about this, but it really does taste so much better. Garnish the dish with freshly grated pepper and a handful of chopped Thyme and Rosemary. 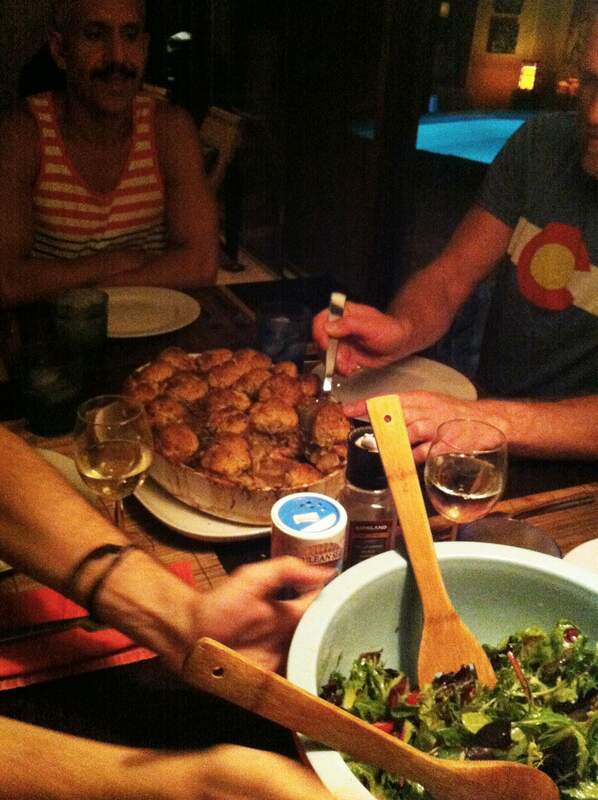 This entry was posted in Recipes, Travel and tagged Chicken with Dumplings, Fire Island Dinner, Rabbit, recipe. Bookmark the permalink.